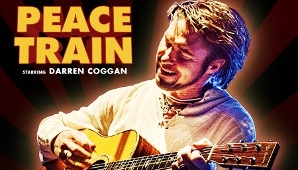 Direct from the highly successful tour of the United Kingdom, Darren Coggan is bringing his critically acclaimed production, Peace Train The Cat Stevens Story back to New Zealand, this August. Peace Train is a night of music and story-telling which will strike a chord deep inside the heart of anyone who longs for something more, a journey back in time, recreating the sights and sounds, seeking out the man in the music and telling the story behind the songs. Hear the hits that defined a generation including Moonshadow, Wild World, Peace Train, Where Do the Children Play, Father & Son, Morning Has Broken and many more,sung with remarkable authenticity by one of Australia’s most exciting artists. Darren Coggan takes the audience on a ride of discovery, back through the joys and the sorrows, the triumphs and the pain, in a celebration of the life of one of the most inspiring and prolific singer songwriters of our time, Cat Stevens. “We take our audience on that same journey of self-discovery that Cat went on and try to answer the question as to, why did he leave the music industry? I had the privilege of being invited to London to meet with the great Cat Stevens in 2007 and I heard first hand some of the many anecdotes and stories that we share with the audience throughout the performance.” Said Darren. Get on board the Peace Train as Darren Coggan traces the path of a man who never stopped wondering about how to make the world a better place.